What do you worry about? ?Do I have any real friends?? ?Will I ever find a spouse?? ?If I do find one, will he or she be faithful?? ?What about my health?? There's always something to worry about. David Powlison recognizes that we have good reason to worry about things. But he assures us that we have much better reasons not to worry! Anxiety is a universal human experience, and we need to approach it with a plan. What do you do when anxieties take over your life? Powlison describes a six-point game plan based on these truths: ?It is your Father's pleasure to give you the kingdom. Your father is God. You need not worry.? - Publisher We have many good reasons to worry. Jesus' words in Luke 12:22-34, however, give better reasons not to worry, and six steps to peace. 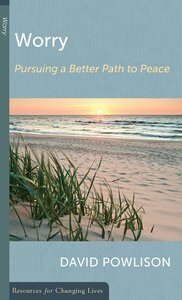 About "Worry: Pursuing a Better Path to Peace (Resources For Changing Lives Series)"
We have many good reasons to worry. Jesus' words in Luke 12:22-34, however, give better reasons not to worry, and six steps to peace.